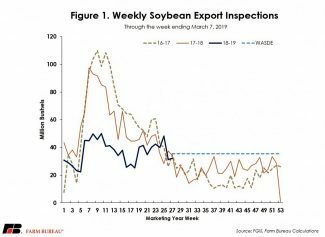 The U.S. Department of Agriculture's March 11 Federal Grain Inspection Service report revealed soybean export inspections at 987 million bushels, down 33 percent from this time last year. 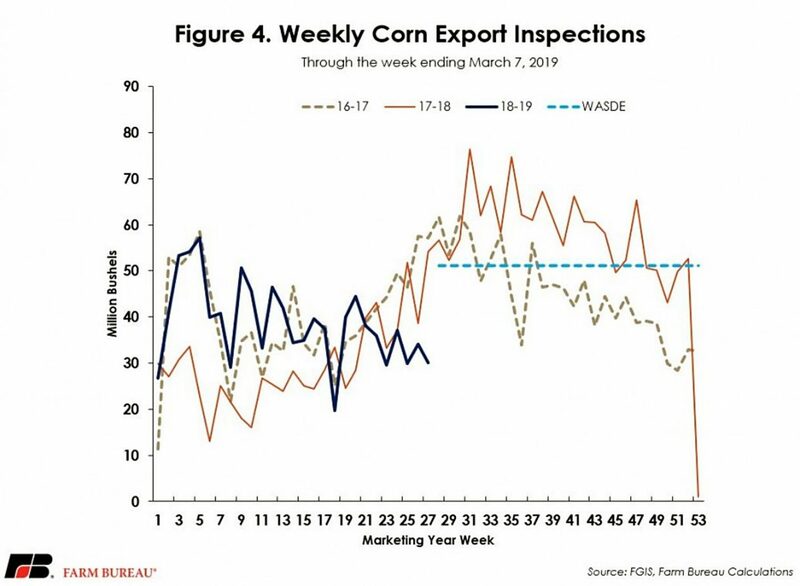 At over 1 billion bushels, corn export inspections are up 241 million bushels, or 30 percent, from prior-year levels. 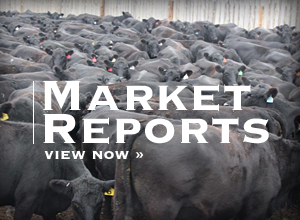 As we move past the halfway mark for marketing year 2018/19, soybean export inspections, at 987 million bushels, are down 482 million bushels, or 33 percent, from prior-year levels. 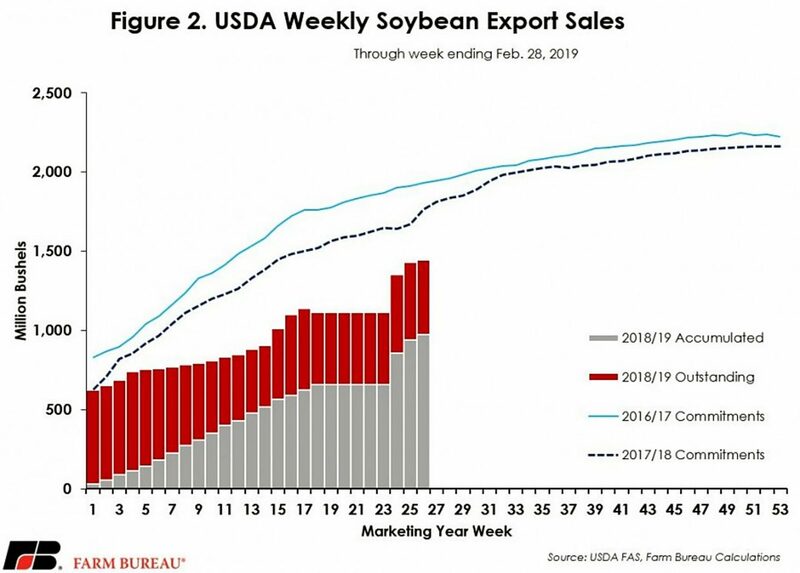 Adding only 32 million bushels to the export totals for 27th week of the marketing year, overall soybean exports remain down 888 million bushels from USDA's projection of 1.875 billion bushels exported in marketing year 2018/19. 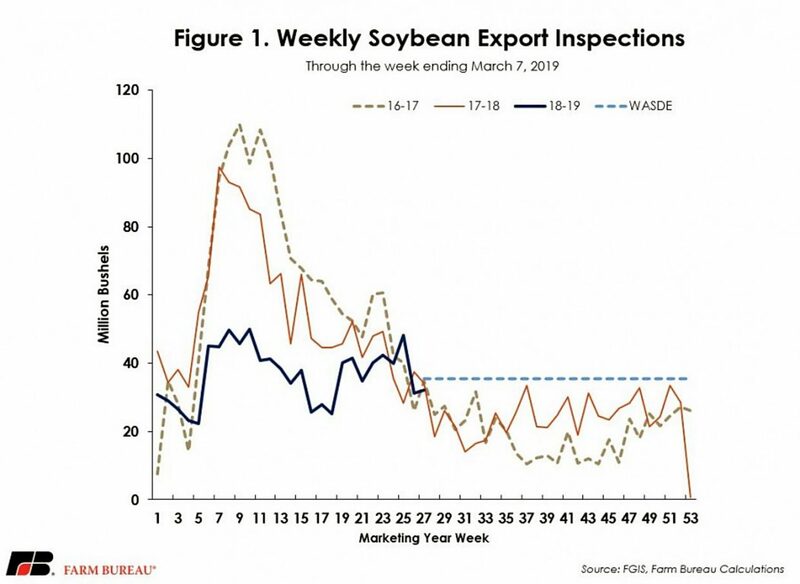 Figure 1 illustrates the weekly soybean export inspections through the week ending March 7. USDA's March 7 Foreign Agricultural Service's Export Sales Report revealed accumulated soybean exports at 976 million bushels. 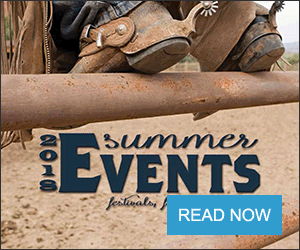 In addition, the report pegged outstanding soybean sales at 467 million bushels. Total committed volume for the first 27 weeks of the marketing year is 1.4 billion bushels, representing a decline of 321 million bushels, or 18 percent, from the same time last year. For marketing year 2018/19, total soybean committed volume remains down substantially from previous years, with a 25 percent decline from 2016/17 levels and a 7 percent decline from 2015/16. Figure 2 illustrates the pace of soybean sales compared to the previous two years through the end of February. 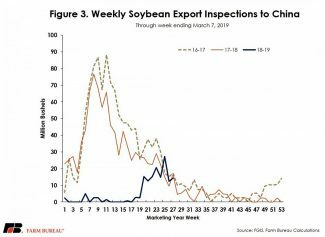 At 152 million bushels, soybean export inspections to China are down 84 percent from last year, keeping U.S. soybean exports well below prior-year levels. 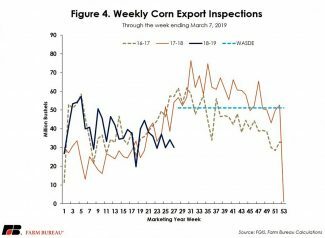 At 14.2 million bushels, the current weekly export inspections for the 27th week in the marketing year are up 2 million bushels from last week's 12-million-bushels. Figure 3 outlines weekly soybean exports inspections destined to China for the first 27 weeks of the marketing year.